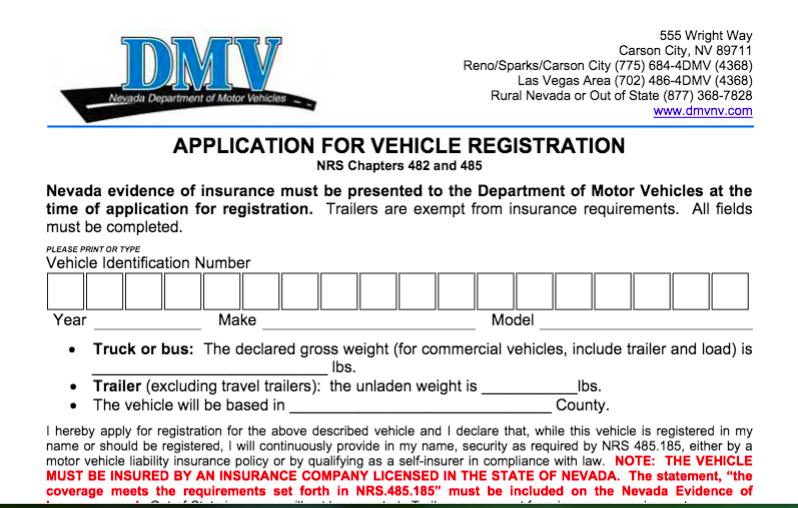 Residents of Las Vegas or other areas of the state, and in some circumstances non-residents, must keep up-to-date registration on their motor vehicles. For new or used vehicles, whether purchased from a dealer or private individual, in state or out of state, the driver has 30 days to complete the process of registering the vehicle. After 30 days, it is unlawful to drive without this paperwork. To get your vehicle registered so that you do not get in trouble for driving an unregistered vehicle in Las Vegas, you will be required to have proof of insurance for this state, some type of bill of sale or title documentation, and the Nevada Emission Vehicle Inspection Report, if required for your vehicle. If a third party is going to complete the process for you, you will also be required to complete the Application for Vehicle Registration. If you have recently moved to Las Vegas or your vehicle has never been registered in this state, you will also need a VIN inspection in addition to the residential requirements. You have 30 days from the time you move to Las Vegas to obtain your driver’s license and to register your vehicle in this state. You will be required to get insurance as well. There are some exceptions to these regulations. If you live within 35 miles of the border of the state and work in Nevada, you do not have to register your vehicle in this state. The same applies if you are a seasonal or a migrant worker. Those who are on active duty in the United States military are also exempt from this requirement. Some students may also be exempt. Students who live out of state but attend school in this state do not have to register their vehicles. Additionally, students who are registered at university or college in another state may be exempt during work study programs that last for less than six months. If you are unsure if you are exempt, you can talk to the DMV or discuss the matter with a qualified attorney. If you are caught driving an unregistered vehicle or one with an expired registration in Nevada, you can face a fine of $1,000. Even if this is the first time you drove without the proper documentation, the fine may still apply. If you feel that you have been fined in error, that you should be exempt from the registration requirements, or you should not have to pay the fine for another reason, it might be beneficial to discuss your options with a seasoned Las Vegas traffic ticket attorney. Bennair Bateman has extensive experience with motor vehicle issues and will be happy to inform you of your rights and responsibilities regarding driving your motor vehicle in the state of Nevada. Have you received a traffic citation for driving without registration in Nevada? Our attorneys at Fix Your Tickets can help you get tickets reduced or even thrown out. For a FREE consultation contact Las Vegas Criminal Defense Attorney Bennair Bateman at 702-605-0505. In many cases, we can get your traffic tickets reduced to a non-moving violation or dismissed with no need for traffic school, and zero demerit points on your driving record.